Provide comfort for the family of Jose Isidro with a meaningful gesture of sympathy. 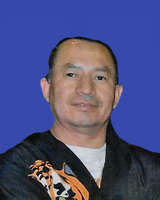 Jose Horacio Isidro, 51, of Mifflin, passed away at 5:45 PM on Saturday, March 30, 2019 in Mifflin. Born on December 5, 1967 in San Alejo, El Salvador, he is a son of the late Marcial Lopez and Maria Antonia Isidro. Mr. Isidro is survived by: his children, Wilber A. Lopez and his wife Olivia of Oakland Mills and Jamie E. Strawser and her husband Luke of Lewistown; siblings, Blanca Lidia Isidro, Julia Lopez Isidro, Maria Ana Garcia De Montesino, Gregoria Isidro, and Phelope Isidro Lopez; three grandchildren, Elysia Lopez, Trevor Lopez, and Emaleah Lopez; and many generations of nieces and nephews. In addition to his parents, he was preceded in death by a brother, Jose Manuel Isidro. Jose was currently employed at Empire Kosher Poultry, Inc. in Mifflintown. He attended St. Jude Catholic Church in Mifflintown and loved walking, watching soccer, but most of all, talking to people about his family and how proud he was of all of them. A Mass of Christian Burial will be celebrated on Friday, April 5, 2019 beginning at 11:30 AM from St. Jude’s Catholic Church, 3918 William Penn Highway, Mifflintown with the Rev. Father William Weary officiating. Interment will follow in the Westminster Presbyterian Cemetery, Mifflintown. A Viewing will be held at 10:45 a.m. until the time of service at the church. To send flowers in memory of Jose Horacio Isidro, please visit our Heartfelt Sympathies Store.